Welcome to 3578 Inwood Dr, a Custom Built Stunner from elite builder, Alvaro Peynado. This is EXACTLY where you want to be. 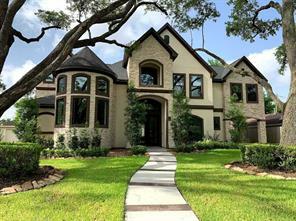 Nestled in one of Houston’s most cherished neighborhoods in Greater Memorial, this Charnwood home truly does have it all. Stunning architecture by Berrios transforms the Spanish Mediterranean design into an ideal layout with an epic outdoor living spread ripe for endless entertainment and luxury living. Boasting 6 bedrooms, Media room, double floor living areas, two bonus mud rooms, and private wine room, there’s simply not more to want for. You can be only a quick jaunt to Houston Raquet Club and a wealth of easy living lifestyle, get the home you deserve. You will find all the reason to make this gorgeous home your own with resort style pool, built in trampoline and all the wonderful amenities you have been waiting for, the possibilities are endless! Custom built masterpiece boasting QUALITY only found in a Home you'd build yourself! Once inside, you'll marvel at authentic wide plank hardwood floors, high ceilings w/ stunning exposed wood beams, solid bronze hardware, custom millwork & arched entries thru out, worlds of natural light & more! Amazing flowing floorplan boasts a regal Master Suite down, handsome Study, large formal Dining Room, Butler’s pantry, Gameroom & more! The massive open Kitchen boasts a huge island w/ seating for 5 or more plus a sprawling “eat-at” Breakfast Bar overlooking the beautiful Family Room w/ wall of French doors, cast stone mantle & fireplace, custom built-ins & more! A Cook’s Kitchen features top-of-the-line Thermadore appliances including gas cooktop, double ovens, plus a spacious Breakfast Room, Mom's CEO-desk/office, Mud Room w/ lockers & more! Electric gate & pave stone drive, plus carport & garage, amazing pool, back yard & awesome covered patio! WOW! Accompanied Showings: Agents please don't hesitate to call, it's my pleasure to show. This custom David Weekley home was built in 2003 on a large 16,398 sqft corner lot. Plenty of room to build a private pool/spa retreat. Home Did NOT Flood in Harvey, Property elevated before home was built. 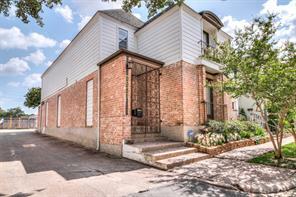 Located in the prime location of Chernwood, minutes away from the Galleria and Energy Corridor. This home features beautiful high ceilings throughout. 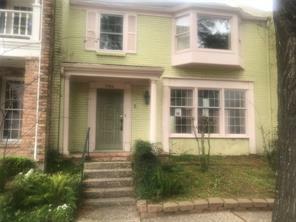 First floor has a formal living and dining room, granite kitchen counter tops, Sun room and large office. Beautiful Master suite w/whirlpool tub, stand up shower, His & Her vanity with large walk in closet. Upstairs, two staircases converge at game room with three additional bedrooms, two baths and many more amenities throughout the home. This beautiful home is situated on a large corner lot close to 1/3 acre. Updated with gorgeous large living spaces and open floor plan makes it perfect for entertaining. Lovely home boast plenty of natural light, hardwood floors, plantation shutters. The Gourmet Kitchen features stainless appliances, double ovens w/convection, granite, large island with plenty of storage, gas stove top surrounded by stunning brick. Seperate dining area has a fireplace. Study has custom cabinets with LED lighting. Master Suite has French Doors leading to a seperate outdoor patio with a fire pit. Secondary bedrooms are wonderful and share a beautiful bathroom. Large French Doors lead from the Family room to a unbelievable back yard oasis and a beautiful salt water pool/spa with fountains. In addition, there is a huge backyard with plenty of green space and lush landscaping. The outdoor area is pefect for large parties or great for kids to play. This home has it all! NO FLOODING! Charming and stylishly updated traditional Charnwood home. 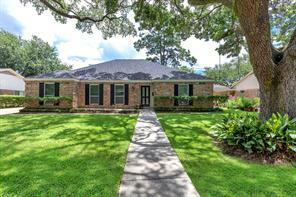 Beautiful refinished wood floors, vaulted family room ceiling, soft colors, and large professionally-designed yard create an inviting atmosphere at this property, nestled in the heart of a highly desired neighborhood. Plantation shutters, kitchen remodeled with high end appliances, recent exterior paint, rear loading garage with storage room above and large motor court. Not immediately visible, yet so important are these improvements: Pex piping, replaced underslab pipes/sewer lines, updated electrical panel, recent 50 gal water heater and HVAC. * Full list of improvements is available. *All info per Seller. This meticulously updated one story home is located on an enormous, tree-lined, corner lot in sought after Charnwood. Zoned to Briargrove Elementary, this very spacious 3 bedroom, 2 ½ bath, open concept living/dining, lots of custom built-in storage and a beautiful study/home office has a serene, parklike backyard. Great schools and all the shopping and dining you would ever need is a minute away. This is the perfect home for you, schedule your showing today. 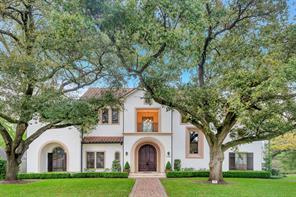 A private PARK-LIKE OASIS (over 25,000 SF) extends 250 ft back with TERRACED GARDENS and enormous LIVE OAK TREES creating an unparalleled feeling of PRIVACY that is hard to find in the city. Build a new home and enjoy the charms of close-in Charnwood. New construction homes in the surrounding neighborhood are very grand and beautiful on these big lots. 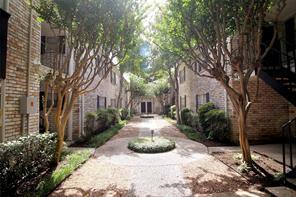 Walking distance to Whole Foods and tons of Houston's most popular restaurants. Charnwood HOA hires a private security company to patrol the neighborhood. SOPHISTICATION MEETS INNER CITY CHIC IN THIS REINVENTED HAMMERSMITH WALK-UP. Offering amenities comparable to new construction, no detail has been overlooked. Highrise inspired floorplan offers modern, open concept layout with high-end designer details & finishes. FABULOUS & FUNCTIONAL… WOOD-STYLE TILE FLOORING THROUGHOUT. Living with French Doors that open to private, enclosed & picturesque courtyard. 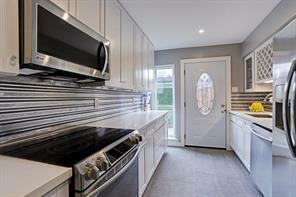 Stunning island kitchen with gas cooking, stainless steel appliances, undermount sink, quartz countertops & subway tile backsplash. Large Master with Plantation Shutters & ensuite offering oversized, frameless shower. New PEX Plumbing. GUEST APARTMENT WITH TONS OF NATURAL LIGHT, BUILTINS & BALCONY OVERLOOKING PRIVATE COURTYARD. Perfect for family, guests or a private home office! GREAT LOCATION! With a “Very Walkable” location near San Felipe & Voss, enjoy the variety of area amenities by foot or, by car, you are just minutes from the Galleria, Uptown & Highland Village & more. 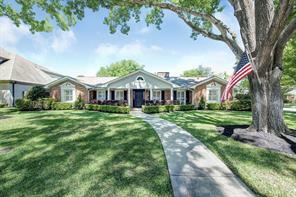 Long-time owner of this smart looking one-story English-style, 3 bedroom, 2 bath, 2-car garage brick Traditional home located in the middle of prestigious Briarbend Subd. Charming home of 2135 SqFt in a close-knit neighborhood. Short distance to Briarbend Park. 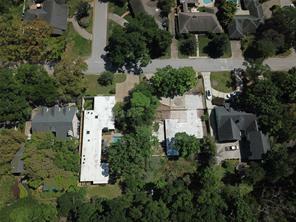 Beautiful lot with mature trees, shrubs and ivy ground cover and a lush back yard. Zoned Sprinkler System, Gutters & downspouts & central drain system. Roof replaced in approximately 2013. Alarm system. Formal Living & Dining rooms, beamed-ceiling Family Room, Kitchen & Breakfast rooms. Partial updates include white-painted wood cabinets, granite counters, kitchen flooring, appliances replaced. Oak hardwoods, some long-covered with carpet. Very comfortable and livable home. Zoned to Briargrove Elementary (please verify). Absolutely stunning French townhome in highly sought after Hammersmith, with a delightful New Orleans feel. 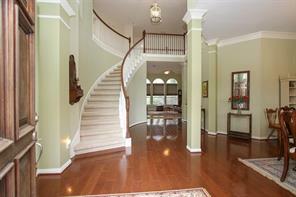 Double door entry, hardwoods, high ceilings, intricately detailed fireplace in the main living room. Two story second living area with brick walls, floors and dramatic sweeping iron staircase with brick open treads. 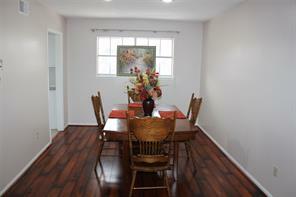 Spacious dining area open to living spaces and kitchen. Upstairs, two generous bedrooms open to loggia, bathed in light. Master bath, with whirlpool tub and separate shower, and walk in closets. Large upstairs deck off secondary bedroom. This is truly a special home. This classic 3/2 Briarbend home with vintage layout and features, has been lovingly maintained by the current owners. Important updates* like roof in 2013, Trane A/C in 2015, hand-scraped engineered hardwood floors, granite countertops, recessed lighting, glass doors in bathrooms, fresh paint inside and out, copper waterpipes, and double-paned windows throughout. A complete list of updates is available upon request. 2-car garage and double wide driveway to accommodate you and your guests. *All per seller. What a wonderful home on Fulham in highly desirable Hammersmith. One of few homes in the subdivision with a front porch which extends to the sidewalk. Perfect for relaxing and visiting with neighbors or guest. Spacious rooms throughout the home. Living room with Tiger Bamboo flooring, multiple seating areas and a walk in wet bar. Dining room contains an oversized table and chairs. Kitchen with granite counters and stainless steel appliances. Breakfast room has a grilling bar to serve steaks in the flex room used as a poker room/exercise room plus sauna. Two staircases upstairs from the entry and flex room. All bedrooms have private baths. The front bedroom enjoys the use of a balcony which has been enclosed so it can be used in the summer. The master bedroom can be reached by either staircase with sitting area, spacious bath and walk-in closet. The third bedroom is above the garage and connected by an enclosed balcony. Don't forget about the community pool and park. 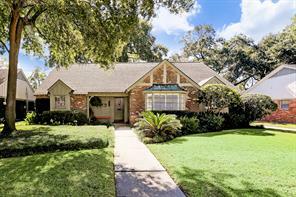 Come home to prestigious Briarbend in the heart of the Galleria area. This pretty traditional home offers you 5 bedrooms with private baths. Many of the bedrooms have french doors to the pool. The pool has the latest trampoline cover to keep your pool clean from winter debris. All of the bedrooms are generous sizes. As you enter this home, you are greeted with both formals. The formal living could be a great study with old time hardwood floors. The grand den has a corner fireplace with a massive hearth to sit on and roast hot dogs. The den flows nicely to the cheerful breakfast and kitchen. The kitchen has mega counter space and cabinets. Spacious utility room too. This charming home sits on a large corner lot with the garage facing a deadend street, so you get additional parking. 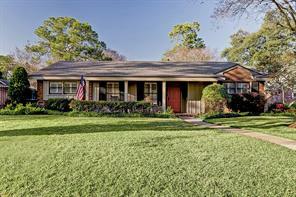 This home has so much to offer and is surrounded by quaint shops and entertainment. It is an easy commute to downtown too on Woodway. Come make this one yours. 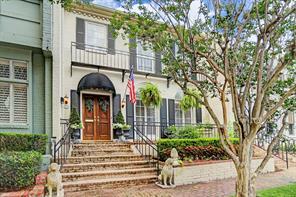 Experience the European charm of Hammersmith in this beautifully updated 3 bedroom home. The property features a state of the art kitchen and incredible finishes. Beautiful first and second floor terraces make this a truly special place you will love to call home. MOVE-IN READY! 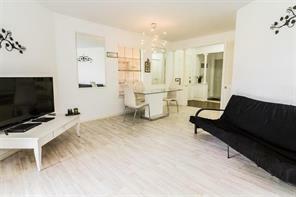 Beautifully updated 3/2.5/2 town home in the highly sought after Hammersmith area. The open kitchen features double ovens, electric cook top, beverage cooler, granite counter tops, ample cabinet space and breakfast area. The over-sized family room showcases large windows bringing in sunlight, built-in entertainment area and a beautiful fireplace. Off the grand entrance through French doors is the formal living and dining areas. The over-sized master bedroom features its own fireplace with sitting area, deluxe walk-in closet and attached bathroom. Two additional bedrooms, a large hall closet and full bathroom finish off the upstairs area. Private, low maintenance back patio and detached two car garage with additional storage area. 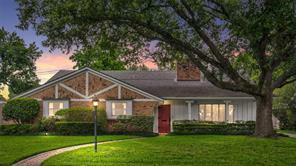 Quick and easy access to Westpark Tollway, Southwest Freeway, 1-10, 610 and the Galleria area. Quiet community with access to community pool, parks and clubhouse. Don’t wait as this incredible property will not last long. PRICED TO SELL! Did not flood. Wonderful opportunity to make this well-maintained home your own in highly desirable Hammersmith. Corner unit w/alley access to the 2 car garage, its recent upgrades include a tankless gas water heater, HVAC units (2016 & 2011), Nest thermostats, garage roof (2013), interior paint (2014), double-pane windows in formal living & den. Great floor plan w/good flow for entertaining. Multiple low-maintenance outdoor spaces include a side patio & a spacious courtyard in the back, plus a balcony at each of the 3 large bedrooms. Master bath tub & walk-in shower has been remodeled & the vanity is plumbed for a 2nd sink addition. Plenty of closet space in all bedrooms & loads of storage throughout. Quiet community w/access to a beautiful pool, clubhouse & park. Fantastic location, just south of Hunters Creek & Piney Point; walking distance to restaurants & shops; easy access to I-10, 59 & Westpark Tollway. Washer, dryer, refrigerator convey. This is an estate sale. All per seller. Fully updated and completely remodeled Very spacious with 3 Bedrooms on the second floor and 2 full bath. 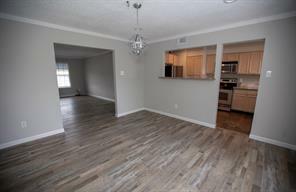 New kitchen cabinets, Granite counter tops, all appliances included, new tile flooring and new carpet. 2 Patios to enjoy with a cover patio. All Utilities included in the HOA Monthly payment. very private with 2 carports included. 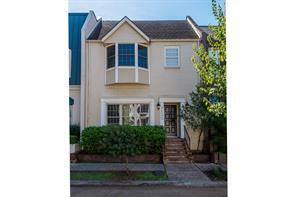 Great 2 story townhome close to everything. 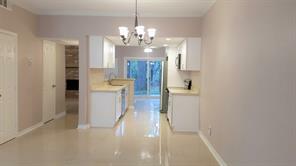 Home offers Living, Dining, kitchen and breakfast room down with a bath, up is 3 bedroom and 2 full baths. There is a balcony off 2 smaller bedrooms. Courtyard style back yard separates the home and garage. Must see Condo in highly sought after Charnwood/Briarbend area location close to Galleria. 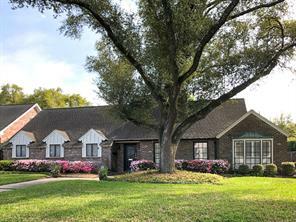 New Orleans charm on this 20 unit complex nestled between mature trees, cosey pool with quiet neighborhood living just west of Briar Bend across from the park on the dead-end part of Woodway. When you drive by you can hear the birds telling you this is your new home. Featuring 2 patio's, plantation shutters, granite countertops, high-end tile in living room, many upgrades, 9' ceilings down, peek-a-boo kitchen into a large living area, enormous master, covered parking or in front of the unit, balcony off second-floor. Wait until you see this beautiful townhome in the heart of everything! 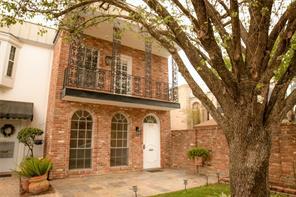 This home has that old world New Orleans feel and has had many new updates within the year. This truly is one of those homes that has to be seen to be understood! Backing to the well cared grounds and a gorgeous pool! Inside and out this home is what you are looking for! Inside the 2 bedrooms upstairs are spacious and roomy. the front bedroom has a balcony overlooking the quite street. The Back patio is the perfect retreat to enjoy the breeze of the night, catch up on a book or just relax with some "me time". the pool is literally 5 steps away from your back gate. 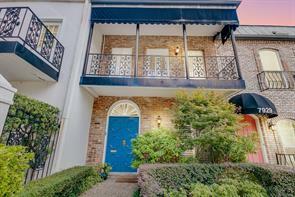 If you love New Orleans, the feel the architecture the attitude...then you are going to fall in love with this beautiful townhome! be sure to click on the Virtual Tour Tab and use the 3D interactive tour to see just how special this home really is, then call us for your own private tour. It is all about Location, Location, Location. Don’t let this home get away. This home is priced to sell. It won't last long on the market given the premier location and the move-in ready condition. Your new home has a private community pool, zoned to Briargrove Elementary and just around the corner is Briarbend park, great restaurants, shops, gyms, grocery store, coffee shops and more! Just inside of Charnwood Subdivision. 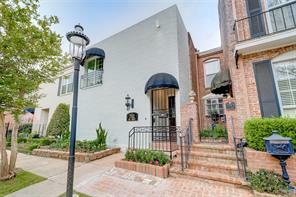 Your French/New Orleans style home offers ironwork on the balconies, beautiful travertine tile throughout the 1st floor, a kitchen that has been updated with quartz countertops, brand new carpet upstairs, new ceiling fans and a private patio. Room dimensions are approx. Buyer to verify. Per seller, this home has never flooded. Bring us your offer before this one is gone! ABSOLUTELY STUNNING renovated 3 bedroom corner townhome tucked at the end of a beautiful tranquil Briar Bend neighborhood with a scenic view. Professionally remediated. No prior flooding before Harvey, per Seller. This unit is spacious with modern updates and includes NEW, NEW NEW paint, quartz countertops in kitchen, cabinets with soft pull drawers, stainless appliances, light fixtures, hardware, faucets and more. All new high efficient, insulated windows and doors. Neutral colors throughout with marble floors down, hardwood stairs and upper and carpet in bedrooms. There are 2 assigned parking spaces, one being at the front door, and one covered carport. Large master has private balcony overlooking back yard. Plus included is patio, partially covered for those cozy afternoons. 2 A/C units less than 10 yrs and new roof. Lies adjacent to Community pool, easy access and convenient to Galleria, Memorial Park, City Center, freeways, grocery stores, shopping. DID NOT FLOOD!! Perfectly charming! 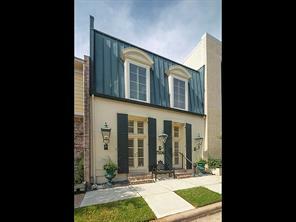 French/New Orleans style townhome nestled in the heart of Charnwood & Briarbend. Hardwoods floor throughout whole house included stairs. 2 large bedrooms & 2.5 baths. Either bedroom could be master. One overlooks the beautiful pool area. Large living area with dinning combo and dry bar. Nice size kitchen & breakfast nook with stone tile floor. Stainless steel appliances. Plantation shutters. Extra utility room in back and not included total square footage. Gated front patio. Recently installed NEW FENCE. Walk distance to Briarbend Park. Easy access to Restaurants, shopping and more! This is wonderful...don't miss!! Wow, what an ideal location! 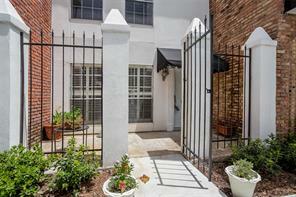 Easy access to the Galleria, Westchase Distrist, Downtown, Energy Cooridor & Memorial schools! Imagine driving home after a long day down the tree lined, winding road. So many great restaurants, shopping & entertainment at your disposal. Not to mention, Trader Joe's & Whole Foods! Your new home is located in a quiet, well established community. Neighbors are out walking their dogs, enjoying the beautiful community pool, & some are getting reading to kayak the bayou! "Home at Last!" You open the front door, take off your shoes, & are instantly relaxed. Preparing a delicious meal in your new kitchen is a breeze with ample storage & counter space. "Time for some fresh air," you think while stepping out on your new patio to water plants, gaze upon the treetops & reflect on how fun your last dinner party was. 2 covered parking spots, HOA maintained & secure community affirms your choice & you'll rest comfortably in your new home! Unit did NOT Flood in Harvey! Best kept secret in the Woodway area. Hidden complex on the BAYOU surrounded by trees & estate homes. FIRST FLOOR unit w HUGE PATIO. Two BR/2 BA perfect for roommates. Lovely shade of grey on the walls. Walk to WHOLE FOODS & tons of area restaurants. Nearby PARK has a boat launch into bayou for kayaking. Electric service is sub-metered by HOA, much cheaper than normal. Underground assigned parking (2 spots). Fridge & stacking W/D included. UNIT DID NOT FLOOD. Welcome home to 1807 Stoney Brook! Imagine driving home after a long day down a tree lined, winding road. So many great restaurants, shopping & entertainment at your disposal! Grocery shop at Whole Foods, Kroger, Heb & Trader Joe's all within 2 miles! Your new home is located in a QUIET, well established community. 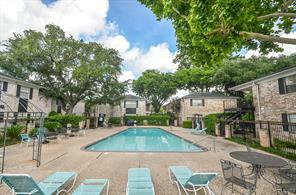 Enjoy the beautiful community pool, & and serene surroundings. You open the front door, take off your shoes, & are instantly relaxed in this beautiful upstairs 2bdrm/2bth condo with amazing space and appeal. Preparing a delicious meal in your new kitchen is a breeze with ample storage, counter space and ss appliances. "Time for some fresh air," you think while stepping out on your new patio to water plants, gaze upon the treetops. 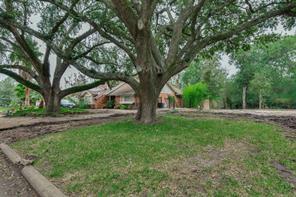 2 blocks to Briarbend Park which has playground, gazebo and a kayak launch right into buffalo bayou! 2 COVERED PARKING SPOTS, Amazing location!! Never flooded! 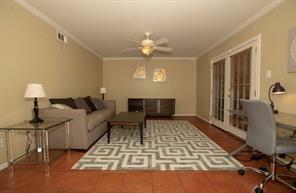 Updated move-in ready condo located in the highly desirable Galleria area. Spacious floor plan with high ceilings, fresh paint, new digital thermostat and new A/C unit. 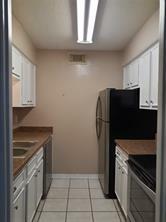 Light and bright kitchen with lots of cabinet space, new dishwasher and microwave. Full size washer and dryer. No carpet anywhere except bedrooms. Large master bedroom suite has high ceilings, ceiling fan and huge walk-in closet. 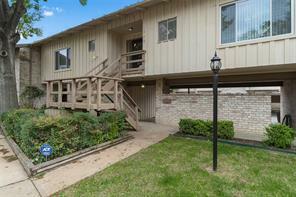 This unit has it's own private patio area and an outside storage shed. The monthly maintenance fee is $273 and it covers ALL utilities including electricity, water, sewer, gas, basic cable, trash pick-up, insurance of building exterior, grounds and landscaping. Location is awesome and centrally located with easy access to the Galleria, Memorial City, IH-10, 59 and Westpark Tollway. Lovely, quiet and a Private retreat in a Beautiful neighborhood setting, backing to Charnwood, on corner of Woodway and Stoney Brook. 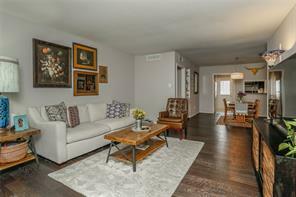 Luxurious and Spacious open concept, one bedroom condo bathed in an abundance of natural light, completely restored original wood Parquet floors, granite counters, stainless appliances, custom window coverings, updated doors, lots of closet spaces & designer accents. This unit has a laundry closet w/washer/dryer hookups. The expansive patio deck will feel like a day at the beach. Low Monthly maintenance fee $250 covers all the utilities including electric, water, sewer, trash, gas, basic cable, insurance on Structure, grounds and landscaping/upkeep. Just move in & unpack. Upper deck unit feels like a treehouse with views of tree tops and skyline view. 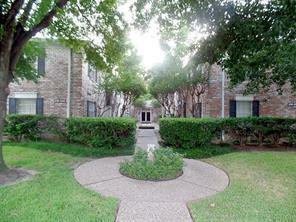 Near Whole foods, Trader Joes, Kroger, HEB & Great retail shopping. Less than 3 miles to the Galleria or Memorial Park. 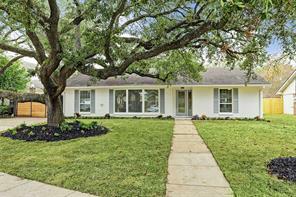 Prime location with nearby access to I-10, 59, loop 610 & Westpark Tollway. 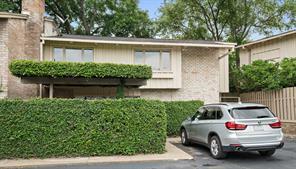 Welcoming corner unit in quiet complex overlooking attractive green space. Two nicely sized bedrooms and two full baths with tub/shower combos and granite counters. Master has private bath with vanity dressing area. Nicely sized kitchen with granite counters and stainless sink. Large dining area is great for entertaining friends and family. Living area looks out to balcony with view of lush communal green space. Washer and dryer hookups in unit. Maintenance fees cover utilities (except internet/cable), grounds and building maintenance and insurance! Excellent location minutes from Galleria, Greenway Plaza, Med Center and Downtown with easy access to a wide variety of dining, shopping and entertainment options! Did not flood in Harvey! CLASSY & SPACIOUS executive one bedroom condo on FIRST floor with high end finishes and awesome kitchen & Bath. Glorious West of Galleria area location. WASHER & DRYER added and included in the unit. QUARTZ counters in Kitchen, ELEGANT cabinets and LED counter lighting. STUNNING backsplash, tile floors in Kitchen. Beautiful wood grain high end laminate flooring, frameless glass WALK in shower and custom shades and tasteful drapes, additional LED recessed lighting added. 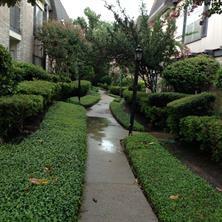 Quiet, serene location so close to all the Galleria shopping and restaurants. DOORS/WINDOWS & PIPES replaced. MARBLE counters in bath, spacious closet, with built-in storage & shelving. Kitchen was wine storage, electric cooktop and REFRIGERTOR is also included. 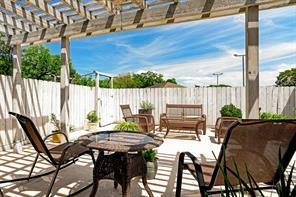 Near pool, Spacious FRONT and REAR PATIOS, with covered parking at your backdoor. HOA MAINTENANCE FEE covers ELECTRIC, WATER/ SEWER, GROUNDS, POOL & Structure's INSURANCE, AC & HEAT. NO PETS, 101 unit Complex sits on 5.7+ acres. COMPLETELY REMODELED. 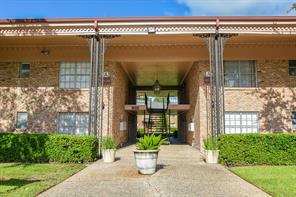 Incredible PRICE for a 3 bedroom unit in the Galleria Area! Versatile floor plan with spacious living and dining areas. Master has two walk in closets. Has amazing treetop views and just a stroll away from the pool! Two covered reserved parking spaces and Central Laundry. One of the large units in the building! ** Drastic price change sold AS IS! 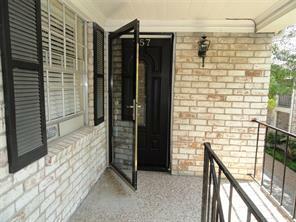 Spacious, open condo, beautiful wood laminate floors, freshly painted. Upstairs with a view of the courtyard. Two very spacious bedrooms and bathrooms. Large master closet. Double closets in secondary bedroom. Very large living and dining rooms. Close to Galleria, trendy shops and restaurants. Mature trees and quaint courtyards make for a beautiful property exterior. Great investment property. 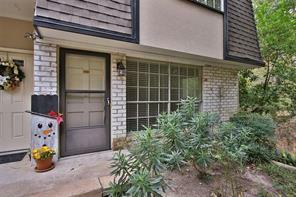 Recently updated Galleria area 2nd level condo in a desirable community close to all shopping. 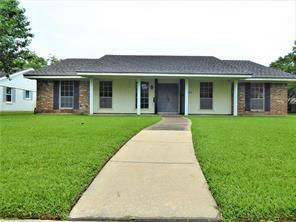 Ready to move in comes with new paint, new carpet, new laminate flooring, new appliances and more. Low 2.5% Tax rate. Central laundry room, and this unit has washer dryer also and a new SS Fridge. One covered parking space. Hoa fees includes water, electric and basic cable (all utilities included)......Motivated seller bring reasonable offers. 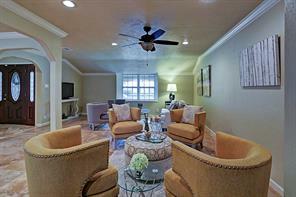 First floor condo just minutes west of the Galleria! Beautifully landscaped walkways, roomy interior, and carpeted bedroom. Stainless Steel Appliances included. Private Patio and wood floors throughout. Call for an appointment asap! READY FOR IMMEDIATE MOVE-IN! ALL UTILITIES INCLUDED PLUS BASIC CABLE FOR ADDED CONVENIENCE. This beautifully remodeled 1 bed/1bath upper unit is located just minutes from the Galleria/Beltway 8 and offers convenient access to the beltway, shopping and amenities. 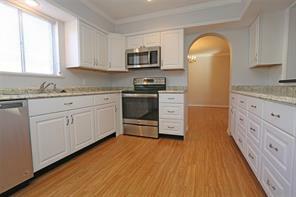 Stainless appliances, Quartz counters in kitchen, wood laminate flooring in living and dining areas. tile in kitchen and bath with granite counters. Refrigerator included. Beautiful grounds, and pool. On-site laundry room, 1 assigned covered parking included. A must see! Great Investment, downsizing or first time home owner! 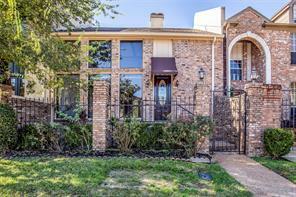 Close to the Galleria area and many restaurants and shopping. This unit is located on the second floor overlooking the beautiful courtyard from the balcony. 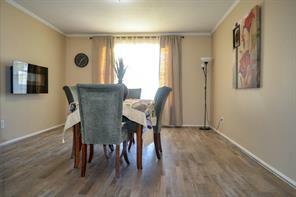 It has a spacious living room with a separate dining room. 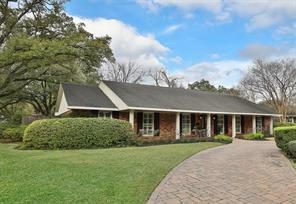 FANTASTIC GALLERIA AREA INVESTMENT AND PERFECT LOCATION IN A DESIRABLE COMMUNITY. One bedroom, One Bath unit on Upper level. 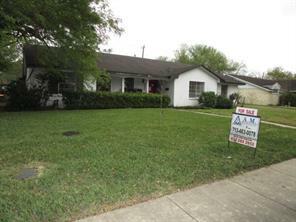 Minutes to Galleria/Beltway 8. Granite Counters and Tile Backsplash in the Galley style kitchen. Separate dining area and nice sized living room. Large bedroom with carpeting a plenty of closet space. Bathroom with granite counters and tub/shower. Private patio overlooks the Green Area. One covered assigned parking spot very close to the unit. Plenty of storage space available. Monthly maintenance fee pays all utilities. Move In Ready!